Fresh, hot coffee. Three words to entice any coffee lover. While coffee preference is unique, coffee lovers agree that the perfect cup begins with a quality coffee maker. Having so many coffee makers on the market, how does one choose? In this article, we will spotlight the KitchenAid brand and look at how different KitchenAid Coffee Makers compare. By the end of our review, deciding which coffee maker to choose will be that much easier. What is a KitchenAid Coffee Maker? The KitchenAid brand has been making kitchen appliances for a long time - 100 years of business in 2019. With quality in mind, their products have made their mark. The KitchenAid Coffee Maker line-up is no exception. The KitchenAid team has developed a coffee maker line-up that celebrates the art of making great coffee. With a KitchenAid Coffee Maker, you can enjoy your favorite drink from the comfort of home - you're one step closer to your cup of delicious perfection. KitchenAid manufactures different styles of coffee makers geared toward different people with different coffee routines. 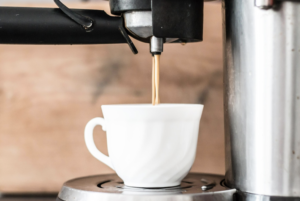 In the KitchenAid Coffee Maker collection, you'll find traditional set-it-and-forget-it, retro, modern and even cold-brew machines, in addition to their ProLine, which offers espresso machines for a cafe-like, crafted coffee. Let's look at how these different styles compare. We will begin our review with the most traditional-style of KitchenAid Coffee Maker - The KitchenAid KCM1202OB. The KitchenAid KCM12020B offers a traditional coffee making experience and a 12-cup capacity. This makes brewing up a batch to share with friends or family a breeze. Unlike traditional machines of days gone by, this KitchenAid Coffee Maker integrates clever innovation, having a refined brew process, a removable water tank, and a variable brew strength selector. The KitchenAid refined brew process ensures evenly saturated coffee grounds during the extraction cycle. This built-in feature is necessary to achieve a well-balanced coffee. The variable brew strength selector gives you the freedom to choose between regular or bold flavor strength. This feature works by slowing down the brew time when the bold setting is selected, which allows more flavor to be extracted from the coffee grounds. 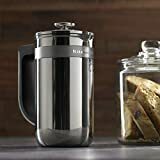 The removable water tank on this KitchenAid Coffee Maker makes not only filling the tank more convenient, it makes cleaning the water tank much easier too. The KitchenAid KCM12020B also has a digital LCD display panel that shows time of day, brew cycle information and a "cleaning needed" alert. With 24-hour programmability, you can set-it-and-forget-it. Your coffee will be ready for you whenever you want it to be. For those of you who just can't wait, the ever-popular pause-and-pour feature allows you to pour a cup mid-brew cycle. The KitchenAid KCM12020B 12-Cup Glass Carafe Coffee Maker sells for around $130. This is pricey for most budgets. 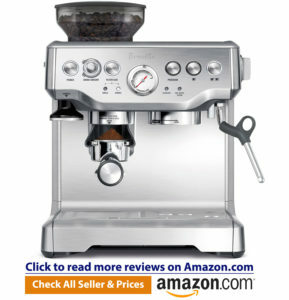 However, the price is in-line with other reputable manufacturers and their pricing for a coffee maker of this caliber. We picked out a few more KitchenAid coffee makers to see how they compare. The KitchenAid KCM0402ER is a personal coffee maker designed for the coffee drinker who's on-the-go. We've given it a 5-star rating for ease of use. The water tank is removable, which makes filling and cleaning easy. Just add grounds to the filter basket and press start. Your coffee brews right into the 18-ounce, insulated travel mug. KitchenAid will replace defective products up to one year after purchase. While we appreciate that, we feel that one year is not long a long enough time-frame. We've given the KitchenAid warranty a 3-star rating. We love the Empire Red color that KitchenAid chose for this sleek coffee maker. The overall design is thin and tall, which makes it easy to find a suitable spot on your kitchen counter, without taking up too much room. The heating element on this machine is vertical, keeping the water temperature consistent during brewing. Another way that KitchenAid has strived to ensure that your coffee tastes great, every time. The 18-ounce, thermal travel mug keeps your coffee hot, while allowing you to drink it on-the-go without spills. KitchenAid went one step further and created a lid design that enables the mug to pour like a carafe if needed. Brew unit stand securely holds brew unit once brewing is complete. Flavor Profile: Bright and rich with a clean finish. Magnetic locking seal securely fastens the brew unit and carafe together. This cool machine brings the old-world craft of siphon coffee making into the 21st century with automatic features powered by electricity. Siphoned coffee extraction uses vacuum technology to deliver superb flavor and a theatrical show. The KitchenAid Siphon Coffee Brewer fully immerses the grounds using precise temperature-controlled water. The heated water creates vapor which pushes the water upwards through a tube that extends through the top and bottom chambers of the machine. When the water enters the upper chamber, the grounds are fully immersed. The water and coffee grounds swirl around until the machine reaches a precise temperature, at which time, the heat turns off. This creates a vacuum effect that pulls the coffee down into the carafe. The siphon method takes about eight minutes to complete. The KitchenAid KCM08120B Siphon Coffee Brewer is a neat machine that provides an alchemic-like experience in your daily coffee routine. While this machine is fairly straightforward and easy to use, it can be intimidating until you get used to it. We feel that after one or two tries, you'll be on your way with no problems. Like other coffee makers, add water, coffee grounds and press start. The machine does the work. All that's left for you to do is pour and enjoy. We can't say enough about the design of this machine. The team at KitchenAid captured the character of a classic siphon brewer from days gone by. They compiled classic styling with modern features and signature KitchenAid details. The glass on this contraption is top-of-the-line from Germany. The metal embellishments are stainless steel. A magnetic latch attaches the top and bottom chambers, which creates a secure bond during the brew cycle and allows ease when detaching, once the cycle is complete. This KitchenAid Siphon Brewer comes with a stand to place the top chamber onto when brewing is finished. The lid of the top chamber then fits onto the carafe, keeping your coffee hot until you're ready to enjoy it. [SMOOTH REFINED TASTE GUARANTEED] -Assures the smoothest taste, Cold brew coffee concentrate is 70% less acidic than hot brews, giving you the most exquisite and refined taste. You can also make cold brew tea. 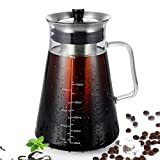 [HANDBLOWN BOROSILICATE GLASS] - The cold brew coffee pitcher is made with thick Borosilicate technology for utmost longevity and use. It's specially-made to withstand rapid temperature changes from boiling hot to ice cold. So it can be used for both hot and iced coffees/teas. [STAINLESS STEEL DURABLE FILTER] - Durable and dual-mesh filter with 0.4mm holes is the best size for brewing,bigger holes leads to coars leaking,smaller holes results in worse taste. [BPA FREE AND AIR-TIGHT] - Being airtight and BPA free makes it perfect for storing coffee too. Store your cold brew tea or coffee for up to two weeks, without losing flavor or freshness. [ HIGH QUALITY NO RISK and 1 YEAR QUALITY ASSURANCE] - SEMKO prides itself in its customer satisfaction standards.Guys, Coffee is life!! How about enjoying the delicious coffee now ? Once buy this product, you own the 1-YEAR-QUALITY-ASSURANCE. Add on cart now!!! The 5KCM4212SX is easy to use. It's so easy, you don't even need to press "start" to begin the brew process. All you need to do in order to begin brewing is add coffee to the reusable filter basket and fill up the water tank. The only additional requirement is patience. As previously mentioned, the brew cycle is between 12-24 hours. Once the brew cycle is complete, just remove the pull-out filter basket and you will have 14 servings of coffee at the ready. We gave this system a 5-star rating for design. It's strong and sturdy, which is in-line with the KitchenAid brand. Its short, cubed shape fits easily into any fridge which is where the brewing process takes place and where the finished product is kept. The brew jar is constructed from heavy glass - roughly 1/4" thick. The other components are constructed from hearty stainless steel, including the filter basket which is finely perforated and keeps most coffee particles at bay. KitchenAid added one more opportunity for filtration - designing the brew jar with a textured bottom that allows fine sediment to settle into. All components easily come apart for simplified soaking and cleaning. All this being said, perhaps there are a few drawbacks to disclose. We found that it dispenses coffee rather slowly. Also, the sturdy materials make it rather heavy. The rubber feet make it difficult to slide the dispenser forward if need be, and in doing so, one must be careful to not disturb the fine sediments on the bottom of the jar. On a positive note, this contraption could also dispense other beverages like lemonade, tea, or fruit juice. Last but not least, the KCM0512SS - a French press coffee maker. This KitchenAid model is not just for coffee snobs. Unlike traditional French Press coffee makers, you do not need experience using a French press to make a legendary cup of coffee. KitchenAid has designed a machine that even first-time users can master. The design seems to be that of a traditional press upon first glance - having a jug and a plunger within it. However, this jug is constructed with dual stainless steel walls which will keep your coffee hot for a long time. And this model holds a 25-ounce capacity. But what really makes the KitchenAid Precision Press stand apart from traditional presses is the integrated scale and timer. KitchenAid went above and beyond by adding these features, making it easy to use by removing the guess-work. Next, you will stir the grounds and water and pull the plunger all the way up. Put the lid on and start the timer. It will be automatically set to four minutes. When the time is up, slowly push the plunger down. Your French press coffee is ready - simply pour and enjoy. And the results really are pretty tasty. With a 25-ounce capacity, the dual stainless steel walls of the jug were essential in the design - keeping the coffee piping hot for a long period. It also has a soft, rubber-grip handle and a classy, sleek outer finish. For these reasons, we gave this KitchenAid Coffee Maker a 5-star rating for design quality. For the most part, the KitchenAid Precision Press Coffee Maker is fairly easy to use. As previously mentioned, the integrated scale, timer and measurement manual are a much-needed missing link for those who have never used a French press to make coffee. And truthfully, after making a few rounds, odds are you won't even need to rely on those added features in the long run. You will need two AA batteries to operate this system. 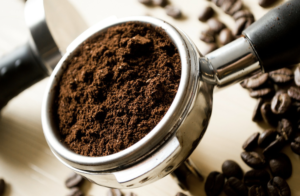 Since a course ground is recommended, you will most likely need to grind your own beans. In addition, you will need to preheat water in a separate kettle and provide the required batteries. For these reasons, we have given the ease of use a 3-star rating. On a positive note, it is fairly easy to clean but using the dishwasher is not recommended because of the integrated timer and scale. In closing, after a thorough look at five different KitchenAid Coffee Makers, each one very different in design and brewing technique, we concluded that our favorite one is the KitchenAid KCM08120B Siphon Coffee Brewer. This machine offers a unique coffee brewing experience which we think any coffee lover can appreciate. It creates a superb cup of coffee that is hard to achieve from the traditional set-it-and-forget-it type of machines. Overall, we give it a 5-star rating. With the Siphon Brewer, the KitchenAid team has successfully brought the forgotten craft of siphon brewing back to modern times for coffee lovers of today to enjoy. If you can afford to treat yourself to this intriguing machine, we think it is a good investment that will provide you with many delicious cups of coffee.